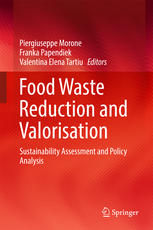 “Food Waste Reduction and Valorisation – Sustainability Assessment and Policy Analysis” is a book edited by Piergiuseppe Morone, Franka Papendiek and Valentina Elena Tartiu. This book adds a new dimension to the sustainability assessment of food waste reduction and valorisation: policy analysis. Featuring a transdisciplinary analysis by key experts in the field, it identifies the drivers of change in food-waste reduction and valorisation technologies by looking, for example, at the regulatory framework and at policy actions undertaken by local and global actors. Since its online publication on April 28, 2017, there has been a total of 5,825 chapter downloads for this eBook on SpringerLink. This means the book was one of the top 25% most downloaded eBooks in the relevant eBook Collection in 2017!